The first Saturday of every month is Judy's day! 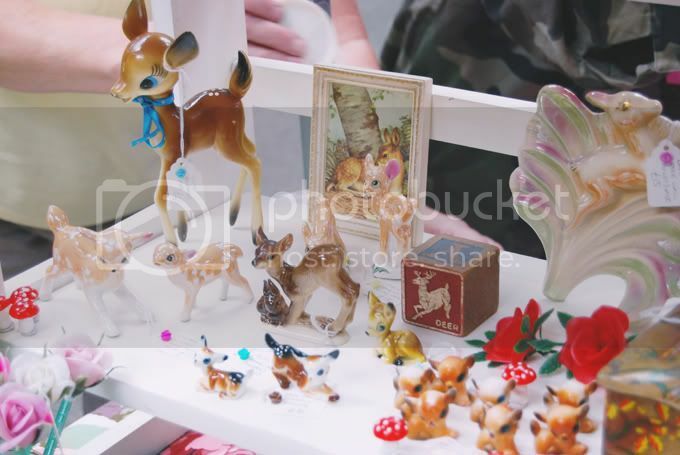 Judy's Affordable Vintage Fair sets up camp at Spitalfields Market for London's biggest free vintage market, bringing fashion, furniture and (my favourite) homeware to the Big Smoke. I was given a very special mission by the Judy's team: To explore all the vintage goodness that the market had to offer, chat to traders, treat myself to some goodies (ok, I might have made up that last one) and, at the end of the day, award my favourite trader with a gold medal. Couldn't make it this month? Hey, don't panic! That's what I'm here for. I took ample photos so I can take you on a tour of the vintage wonderland. So grab a cuppa, settle down and join me on a journey through Judy's. Just look at this fella. Oh, how I wish I had bought him! I'd have called him Fred and given him pride of place in my living room. It's easy to forget practicalities once you're home and looking at the photos. Practicalities like how would I get him home on the evening train (which, by that point, bursting at the seams with exciteable Olympics spectators) without looking like a complete nutjob! With pure childish delight, I had to test this bell to see if it worked. It did! I should have bought it, so I could ring out to Rich every time I need another Diet Pepsi top up! Ding ding: Service please! I have a bit of a thing about vintage clocks. Paris Accent had a whole display full of them. An absolute delight for me. You can never have too many timekeeping devices! (Except watches. I don't wear watches). Winchester Vintage has the most amazingly pretty dresses. Unfortunately, I currently have no need for a 1950s party dress. I know just where to head when the opportunity does arise though! I also had a very lovely chat with Charlotte, the lady behind the dresses. She nearly coaxed my partner-in-crime Jess to a red beaded number on the basis that she could wear it around Asda and out-fabulous everyone. Not that she needed much coaxing! Just look at this beautiful dressing table set up! It's powder-puff perfection! I wish my dressing table looked like this. Maybe I should go back and buy out the whole thing? I was particularly enamoured by this 1950s (I think) wedding veil and tiara. It belonged to the trader's aunt who is the lady in the photo. I love hearing the stories behind the items! 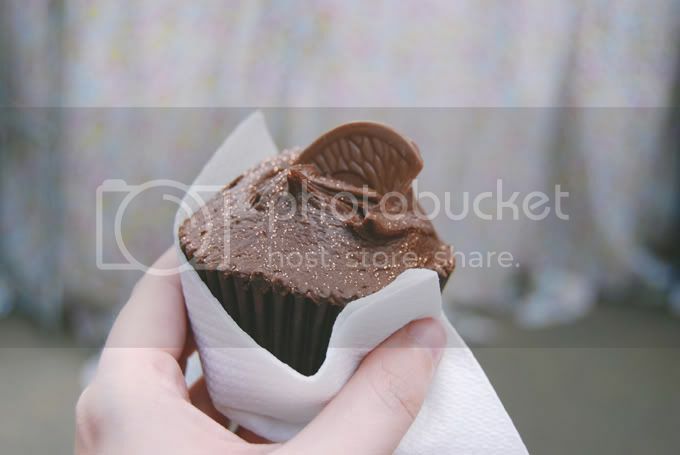 "The best darn cupcakes you ever had!" exclaim Betty-Lou's Bakery's business cards. I'm not going to lie, they might well be! They look absolutely beautiful, all made by a very glamorous baking pin-up, and are in the most luscious of flavours- After Eight, Malteser Marvels, Peanutbutter Glory... The list goes on! Not only do they taste incredible, but they look beautiful too! I treated myself to a Terryfic Chocolate Orange. It was so naughty but so good! How could I resist the golden edible glitter sprinkled on top of chocolate frosting? Ok, so it is time for the Victory Ceremony. Who won my gold medal for favourite trader of the day? Get the Union Jack ready, belt out the National Anthem and sing your little hearts out for I Heart Vintage! Cambridge-based I Heart Vintage is owned by the absolutely lovely Rebecca Chambers. Not only did she recognise me from my visit in April, but she could remember exactly what it was I had bought. Now that is customer service for you! How lovely to experience a seller who truly cares about every single customer! Rebecca takes great care over the presentation of her stall and I'm sure you'll agree that it is absolute perfection. On awarding Rebecca with her medal, I stretched my journalistic wings and interviewed her with some grilling questions to get you a juicy exclusive... Ok, I'm totally lying. Though I did ask some little questions to give us a little insight into the brains behind I Heart Vintage. Rebecca's favourite eras for vintage are the 1950s and 1970s due to the chintzy homewares and because "kitschness owns my heart" (I hear you, girl!). Her favourite item of the day was the Babycham deer (seen above). I was very lucky to get this image as it had sold out by the end of the day. A perfect example of why you should turn up early! 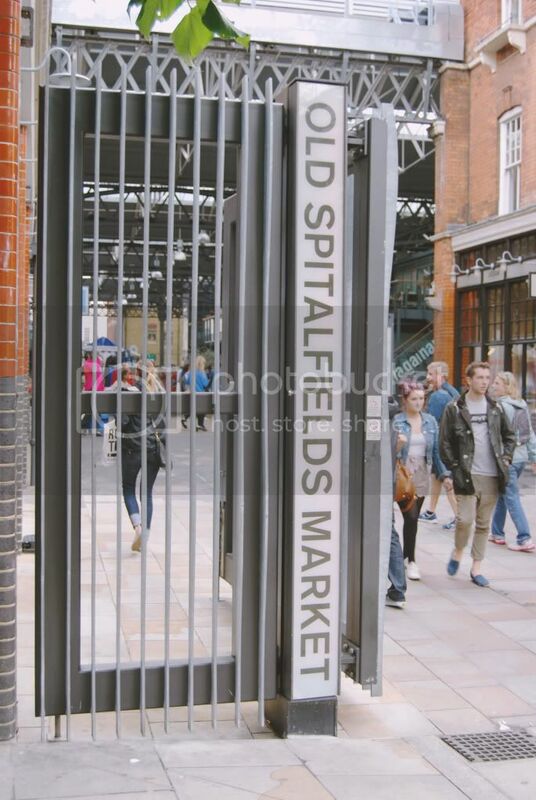 Rebecca loves Spitalfields because it is a great place for people watching as everybody is different and there's great fashion and architecture. Not to mention the cute little dogs everywhere! If you are planning a visit to Judy's Vintage Fair, do pay I Heart Vintage a visit. Though not before me. Don't go stealing all the best stuff before I get there! I have to agree with Rebecca about people watching. There are stylish folk abound, from the vintage perfectionists to the quirky eccentrics. I couldn't write this post without treating you to some of my favourite fashionistas! Sarah (left) and Georgia caught my eye because of their wonderful takes on vintage style. I love how Sarah's simple (but still lovely) dark dress provides the perfect backdrop for her matching hair/lips/shoes/nails combo. That's commitment for you! And just look at those fabulous glasses! As for Georgia, she rocks Bettie Page va-va-voom! With her skin tight jeans teamed with a leopard print top, she certainly knows how to rock her style! I can't forget to mention her pin-up hair. Beautiful! Since London is a breeding ground for style eclecticism, I was not surprised to find quirky sartorialist adventures such as this amazing Oliver Twist meets south-east Asia get-up. I also love the way Katie (right) has toughened up her pretty lace dress with a black jacket and Western boots. Plus, the hair and make up is sensational! Filipa's (left) cute, nautical look caught my eye straight away. Red, white and blue is always a winning combo for me, especially when stripes and pleats are involved! I adore the clever coordinating with the pretty lace collar and lace-trimmed socks. Adorable! I couldn't end this post without mentioning Jess, my BFF for the day. Jess has a very simple style motto: Add more beads. Donned out in a vintage top and skirt, with lots and lots and lots of sparkly beads, she is a younger, cooler Joan Collins. "Yeah, yeah, they're all amazing and all, but what we really want to know, Becky, is what did you buy?" Well, dear readers, let me show you. The salt and pepper shakers are from I Heart Vintage. They have cute little scenes of London on, including the Houses of Parliament which is especially special to me as it is where Rich proposed. The adorable little piggy bank is also from I Heart Vintage. I nearly didn't buy him. I picked him up, put him down, went for another wander, came back and picked him up again. He looked at me with his big eyes and happy little smile and I just couldn't resist! I'm a sucker for pigs! Rich and I unanimously and instantly decided on the name Percy. The clock is from Paris Accent. It is in perfect working order, alarm included. I love the mint colour and the little dials within the dial. I have no idea what these wooden Olympic bats are, so please do tell me if you know. Both the trader and I tried to work it out but we were none the wiser. Nevertheless, I love them and they serve as a lasting vintage memento of the London Olympics. Finally, I had to fork out one pound for this hankie. It has dogs playing baseball on it! Who doesn't want a vintage hanky printed with cartoon dogs playing baseball? So there we have it! My tour of Judy's Vintage Fair at Spitalfields is complete. See you down there next month! A lovely write up! I love Judy's vintage fairs.... constantly waiting for them to announce that they're coming back to my nearest city! The event at Spitalfields looks like it was awesome; would have loved to be there mixing with all those well-dressed people! Oh, and those cupcakes look delicious! Cupcakes + Cute Knick Knacks = WIN! Your blog is beautiful and I really like your style!! Love love love that flamingo LMFAOO! Such great finds! You have a really interesting style from what I can see. I like it. Love the outfit photos you took of everyone here, too! The cupcakes look amazing. Judy's was great when they came to Norwich, I hope they come back my way soon! Love the street style pics! So many great & unique things! The flamingo is super cute. Sounds like a really fun vintage fair. If I'm in the area, I'll have to check it out! Oh my, this looks amazing! I will definitely visit it next time I'm in London! This is such a cute post! Now following you fellow street teamer! What a fun and super successful adventure. So many stylish people! Hope you’re having a great Wednesday! Drop by nichollvincent.blogspot.com and say hello! Hi! I saw you on the link up! Great blog! I read all comments and appreciate every single one, even if I can't always reply. If you have a question or need a reply, feel free to tweet me @BeckyBedbug- I always reply to tweets!